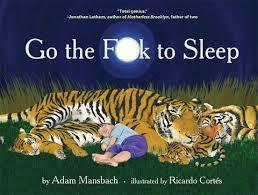 In a box full of used baby books and toddler games, a friend gave us a timely read titled Go the F*ck to Sleep (click here for a version narrated by Samuel L. Jackson…no joke). Written and illustrated in the style of a childhood bedtime story, it also illustrates the reality of caring for a baby who won’t sleep. I’m writing this after a night I struggled to get my baby to sleep for two hours (6:30-8:30 pm), was awakened at 12pm and 3am (and this is an average night) and then saw her wake at 5am for the morning. What the f*ck!! So while my last post was about letting go, this one is about giving up. While there are days you smile, giggle and coo with your infant all day long, there are other days when you feel like putting them in their crib, getting in the car and driving away. Preferably to a 5-star hotel with a comfortable bed where you can sleep a week straight. But of course, you can’t, so you just walk away and listen to them scream through the walls for 5-15 minute intervals, or you give up and bring them downstairs and set them in their play yard, so you can go online and read every sleep blog you can find. In the past 8 months I’ve read every blog, talked to dozens of parents, ordered 3 sleep books, and posted endless messages on a local mothering Facebook group. We tried the modified cry-it-out, the full cry-it-out, the rock to sleep, the nurse to sleep, the scheduled bedtime, the flexible bedtime and so on and so on. Nothing has consistently worked, the night and early wakings have continued. Of course it could be worse, we could be up every hour, in which case I’d have already been committed to a psychiatric hospital. You might be reading this because you are in the same boat. If you are, I’m sorry I have no advice to offer on getting your cherub to sleep well. The advice I can give is you are not alone in feeling how you do. A new parent feels many emotions and some of them not so pleasant. Before they are born, you say to yourself – “I’ll never resent my child, never think about leaving them, never yell at them, never leave them to cry, never….never…never” – but you might and not getting enough sleep for 8 months doesn’t help. Don’t get me wrong, I’m not going to harm her or myself, I still love her more than anything and the good times still outweigh the bad, but it’s therapeutic to admit that it’s not all sunshine and roses. So what am I going to do? I’m going to give up. Give up reading the books, the blogs, reaching out for advice and just let her sleep on her own schedule for awhile. I’m tired from lack of sleep, but I’m also tired from stressing out (and probably stressing her and my husband out too). Not all babies sleep through the night, have a predictable bedtime, or sleep the quote unquote “age appropriate” number of hours a day. My daughter is healthy, happy and beautiful and as we all said before they were born, that’s all that matters. PS – Tip for parents who’s babies DO sleep well. When you meet other new parents DO NOT lead with the question “So how is she/he sleeping”. Just assume everyone else’s kid isn’t sleeping. And when I say “quite terrible actually”, don’t ask me if we’ve done sleep training yet. And if I have the courage to ask you how yours is sleeping, lie and tell me they are up just as much as mine. Yup, give up and give in. That works for toilet training too. ← What happens when a workaholic, socialite, athlete has a baby?